Wisconsin Speeding Accident Injury Attorneys | Hupy and Abraham, S.C. In just an instant, someone else’s decision to speed can cause you serious injury or kill your loved one. Speed-related accidents remain one of the primary causes of traffic injuries and deaths in Wisconsin and across the nation. In 2014, 20,887 Wisconsin accidents involved a speeding driver, and 163 deaths and 8,114 injuries were reported in these crashes. What Is Speeding in Wisconsin? Exceeding the posted speed limit. The state of Wisconsin operates under an “absolute” speed limit law, leaving no margin for error when it comes to exceeding the displayed speed maximum. For example, if a speed limit sign says 25 mph, someone driving 26 mph may be pulled over and ticketed. Driving too fast for conditions. In Wisconsin, a driver may be ticketed for speeding even if the driver is driving at the posted speed limit, if the driver’s speed is deemed unsafe for current conditions. Current conditions include weather conditions and the flow of traffic, for example. A driver who causes an accident for either of these reasons may be liable for any injuries or fatalities that result from the crash. If you have been hurt in an accident or if you have lost a loved one in a crash, and another driver in your crash has been ticketed for speeding, then it is important to see a personal injury lawyer as soon as possible. 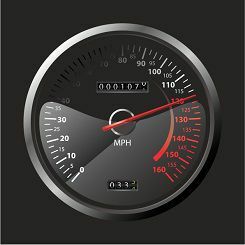 The speeding driver may be liable for some, or all, of your accident damages. Those damages may include your past, current and future medical expenses, lost income, out-of-pocket costs, physical pain, emotional suffering, and other expenses or losses. To find out more about the actions that you can take to protect your legal rights and financial recovery, please read our free book, The Ultimate Guide for Automobile Accident Victims, and fill out our online contact form today. Will You Get a Speeding Ticket? What Causes Wisconsin Car Accidents?